The S size of this product has been discontinued as of September 2018. The L size will still be available. The NEBNext® Fast DNA Fragmentation & Library Prep Set for Ion Torrent™ includes enzymatic DNA fragmentation in a streamlined, high-performance library prep workflow. The NEBNext® Fast DNA Fragmentation & Library Prep Set for Ion Torrent™ includes a master mix of reagents for enzymatic DNA fragmentation combined with end repair. This enables efficient and tunable DNA shearing and blunting with minimized sample loss before performing adaptor ligation and high-fidelity library amplification. The kit is compatible with input amounts from 10 ng - 1µg, with a workflow time of under 2 hours and ~12 min. hands-on time. Adaptors and primers for singleplex libraries are supplied in the kits. For multiplexed libraries, the Ion Xpress™ Barcode Adapters from Thermo Fisher Scientific can be used. If mechanical shearing of DNA is preferred, a version of the kit without enzymatic fragmentation reagents is available. 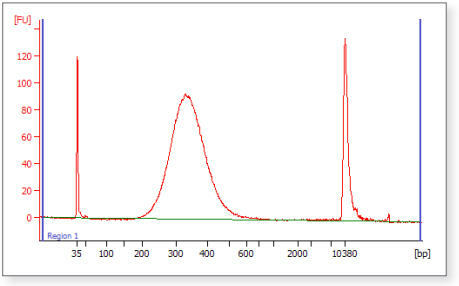 Figure 1: Relative size distribution of Fragmented End Repaired DNA as seen using the Bioanalyzer® 2100 (Agilent Technologies, Inc.). 1 µg of E. coli DNA was fragmented and end repaired for 20 minutes at 25°C, followed by 10 minutes at 70°C. Figure 2: Final Library size distribution using AMPure XP Bead Size Selection. Figure 3: Final Library Size distribution using E-Gel Size Selection. 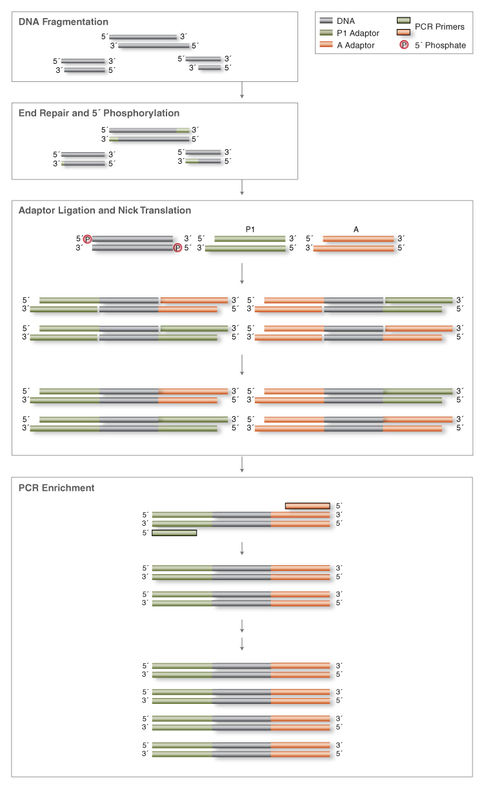 What sequencing platform can I use the NEBNext remove DNA Fragmentation & Library Prep Sets for Ion Torrent reagents for? What type of starting material can be used with NEBNext Fast DNA Fragmentation & Library Prep Set for Ion Torrent? How much starting material do I need to use when preparing libraries using the NEBNext Fast DNA Fragmentation & Library Prep Set for Ion Torrent? 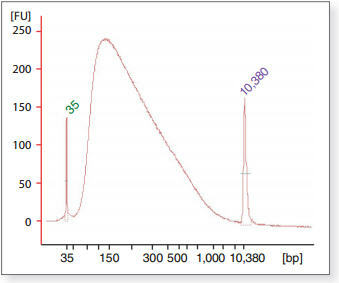 Does the NEBNext Fast DNA Fragmentation & Library Prep Set for Ion Torrent work well for GC-rich DNA and AT-rich DNA? Can I use the NEBNext Fast DNA Fragmentation & Library Prep Set for Ion Torrent for preparing RNA? What methods for size selection can be used with Ion Torrent Library Preparation Kits? Are these reagents available in a customized format or bulk format? What do I do if my fragmented DNA is too short? The peak on my electropherogram trace is broader than I would like. How can I make the size range more narrow? Do I really need to vortex the fragmentation reactions, as described in the protocol? Will pipetting up and down work just as well? What do I do if my DNA is not being fragmented? Are DNA adaptors or oligonucleotides included in the NEBNext products? This product is covered by one or more patents. This product is licensed from Bio-Rad Laboratories, Inc., under U.S. Pat. Nos. 6,627,424, 7,541,170, 7,670,808, 7,666,645 and corresponding patents in other countries for use only in: (a) standard (not real-time) PCR in the research field only, but not real time PCR or digital PCR; (b) real-time PCR for use as a library preparation quantitation tool in Next Generation Sequencing workflows; (c) any in-vitro diagnostics applications, except for applications using real-time PCR or digital PCR; and (d) any non-PCR applications in DNA sequencing, isothermal amplification, and the production of synthetic DNA. Notice to Purchaser: Nucleic acid-based aptamers for use with thermophilic DNA polymerases are licensed exclusively by New England Biolabs, Inc. from SomaLogic, Inc. (See Patent Nos. 5,475,096; 5,670,637; 5,696,249; 5,874,557; and 5,693,502). New England Biolabs, Inc. gives the Buyer/User a non-exclusive license to use the aptamer-based Bst 2.0 WarmStart™ DNA Polymerase for RESEARCH PURPOSES ONLY. Commercial use of the aptamer-based Bst 2.0 WarmStart™ DNA Polymerase requires a license from New England Biolabs, Inc. Please contact [email protected] for more information. NEBNEXT®, NEW ENGLAND BIOLABS®, WARMSTART® and Q5® are registered trademarks of New England Biolabs, Inc.
LITMUS™ and THERMOPOL™ are trademarks of New England Biolabs, Inc.
AMPURE® is a registered trademark of Beckman Coulter, Inc.
BIOANALYZER® is a registered trademark of Agilent Technolgies, Inc.
ION XPRESS™ and ION TORRENT™ are trademarks owned by Life Technologies, Inc.